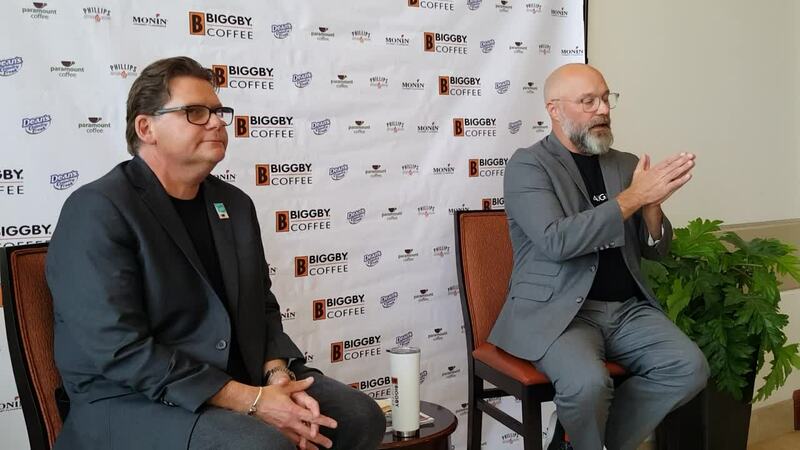 Last evening at the annual meeting of the Biggby franchise owners, FOX 47 News had the opportunity to hear from co-owners Bob Fish and Michael McFall. In today’s sit down, both Fish and McFall started by sharing their own history as being co-owners of Biggby from the very beginning of the company 23 years ago. They stated that there are a few new things that will change Biggby for the better in the coming years. First, they anticipate a cultural shift that will move through the company. Both Fish and McFall explained that in 2014 they started on a journey to find a purpose for their company. This is not to say that a purpose was not there in the past, but instead that they were not good at articulating their message. Back in 2014, people in the company completed a cultural survey and the results were shocking. Because of these results, they connected with Nathan Havey of Thrive Consulting Group. They partnered with Havey to help work on cultural change within the organization and to help them to develop a company that works to help its’ employees build a life that they love. From this new culture and the tenets that they have set in place, they hope to develop a curriculum for all employees to follow, as well as, being able to tell their story to others and impact corporate culture throughout the United States. All of this work comes with metrics that they are planning to track and they hope by 2028 to have 90% of all employees not only completing the cultural survey, but also ranking the company and the owners at a 9 or 10 out of 10 in regards to satisfaction. Outside of the cultural change within Biggby, they also have an aggressive growth model that they are following as a company. In the past few years, they have instituted a model of having area representatives within markets outside of Michigan. These area representatives support local owners to help them find success. Currently, Biggby has area representatives in four markets including: Charlotte, North Carolina, Cincinnati, Ohio, Cleveland, Ohio and Jacksonville, Florida. Fish and McFall explained that the company has a plan to add at least four more area representatives to expand the reach of Biggby into new markets. In expanding, they will use the same concept they followed in Michigan to concentrate large numbers of stores in geographic areas. The final piece of news surrounded a new initiative that Biggby is starting called the Passion Ship. This project allows employees to put in applications to have their passion projects possibly become reality. These projects, if funded, will be funded through a dollar for dollar match from ready to drink beverage sales that will fund a new foundation that Fish and McFall are starting. It is their hope that starting at the next annual franchise meeting, they will be able to fund 1-2 Passion Ship projects. As you can tell, there is a lot going on with Biggby beyond just making great coffee. This is a Michigan Made company that is doing good for our state and for our nation. The future of their company continues to look bright. After reading all of this exciting news about Biggby Coffee, I bet you are still wondering when Pumpkin Spice latte season is back. We are told soon, very soon.